My work focuses on Birmingham city centre, particularly looking at the buildings from the 1960's and 70's that people think are unattractive and functional, in preference to the decorative or iconic buildings. 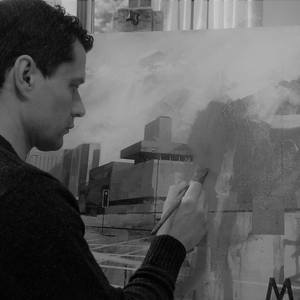 However, because there are few recognisable buildings in my work, the exact location of each painting is not important; they are about cities and generic urban architecture. I try to make the ordinary and mundane look interesting and attractive through the use of abstracted colour, expressive brush marks and dynamic compositions. 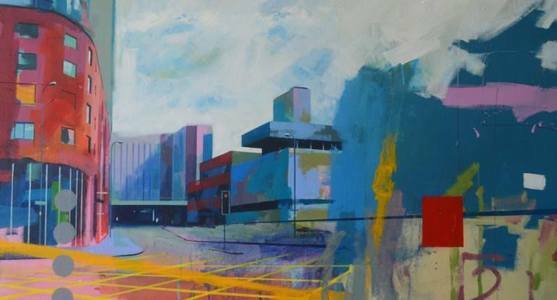 The shapes of the roads, street signs and the architecture of office blocks are features that reoccur in my work. Abstract elements are becoming increasingly significant and I often include marks, letters and symbols taken from the streets and these abstractions and the use of materials are just as important to me as the subject matter. No people feature in my work, and there are few cars as I am not freezing a split second in time, the absence of people also makes the work more tranquil and contemplative. The titles are either taken from elements found within the paintings or words and phrases I find in the city.